On April 20th, 2010, The ultra-deepwater oil prospecting rig, “Deepwater Horizon” experienced a blowout and exploded killing 11 crew members. At the time, the crew was celebrating a record accident-free operating period at the time. Irony can be pretty ironic at times. Ultimately, this would become the largest oil spill in US history and result in the entire restructuring of the United states minerals management service into BOEMRE. How the Blow out occurred is in this handy graphic below. The University of South Florida-College of Marine Science, being largely unencumbered by political affiliations or contracts with oil and gas was able to self-fund a number of research trips. On August 6th, 2010, BP and the US government announced that there was no subsurface plume. By August 11th, we had evidence that it existed and was moving up through the De Soto canyon, off Pensacola, FL. Photographs I took were featured in Multispecies Salon 3: Swarm! held in New Orleans, Nov, 2010. Following is my artist statement and a couple images from the show. Crude oil, benzene, toluene and a variety of assorted organic molecules released by the Deep Water Horizon event continue to float through the gulf of Mexico. In some instances they fuel a boom and bust ecosystem of chemosynthetic microbes. In other instances they are simply there. These photographs were taken over the course of several days on the FIO research vessel the R/V Weatherbird II. Our cruise took us on the west florida shelf 26 mile sform the well head. Some of the water is so close to the surface as to contain phytoplankton, others are from the depths. 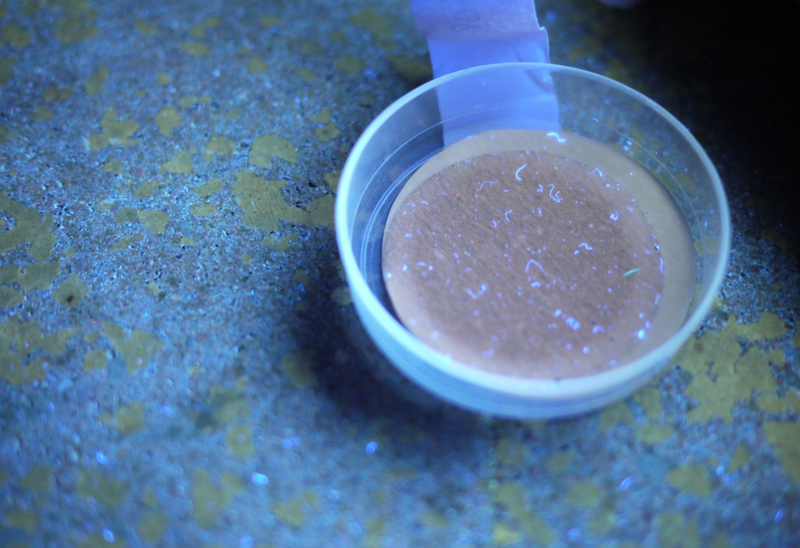 We collected mud samples from the surface of the sea floor and pumped enormous quantities of seawater through filters. We then took them into the darkest room on the boat, a berth on the main deck without windows shut the door and illuminated them with a UV lamp. It is difficult to hold a camera still, even braced well for a 2 second exposure. At 254 nM there are a suite of particles that fluoresce strongly. These are the organic molecules associated with crude oil. These specks are believed to be oil adhered to marine plankton skeletons. Fine particles suspended in seawater are not able to fall through the water column fast enough to reach the bottom this quickly. Dispersed oil behaves in the same manner, without assistance it would take many months for dispersed oil to separate. However, by adhering to larger particles such as plankton skeletal fragments, oil and other materials can be transported to the bottom of the ocean much more quickly. 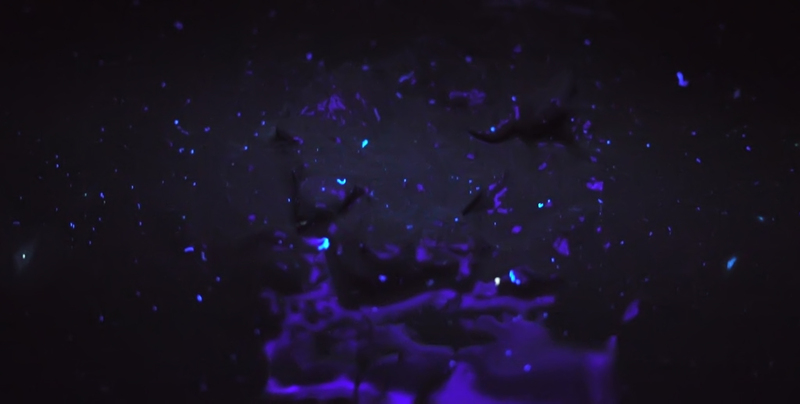 The result is a veritable “constellation” of deep-UV fluorescing particles. Oiled Dinoflagellate Chains on Sub-surface filter.